I was raised in the ministry of chair folding. Saint Andrew was an expert in this ministry. When I was young, my parents led the prayer group at church. We were often at our parish setting up chairs and executing the mundane tasks needed to make the ministries at our church happen. These are the jobs in the ministry of chair folding. My father coined the phrase. It is the ministry of the unseen—it does not involve being noticed, heard, or acclaimed and instead involves setting up and taking down chairs, decorating sanctuaries, organizing logistics, doing paperwork, and loving one’s neighbor in the simplest of ways. It is the hard and humble ministry of the unnoticed. Today’s feast celebrates a man who knew what it was like to go unnoticed. Throughout his life, Saint Andrew played second fiddle to his dynamic and well-known brother Simon Peter. Peter was an incredible teacher. He was the first Pope. He resurrected Tabitha. Everyone remembers Peter, few remember Andrew—he is often only referred to as Peter’s brother. However, without Andrew, there is no way to know who would have introduced Peter to Jesus. (Jonh 1:40) While Peter was busy using his gifts in a public way, Andrew was off to the side, humbly under the radar, talking to people, folding chairs, wrapping microphone cables, washing dishes, asking about people’s lives, stuffing name tags, making ministry happen. He did whatever needed to be done to help people come to know the Messiah. Andrew was open-hearted, always humbly loving those around him. He was the one who knew about the boy’s lunch in the multiplication of the loaves and fishes. (John 6:8) He was the one Philip deferred to when the Greeks wanted to meet Jesus (John 12:21) because he knew how to bring people to Christ. His heart was fixed on it. Nothing else mattered to him. He shows us how to be the one who is not esteemed or acclaimed with dazzling humility and astonishing grace. If you feel as though you are e’er the woman playing second fiddle, constantly unnoticed, consistently unappreciated, today is your day, because today is Saint Andrew’s day. How beautiful are the feet of those who cook the food, sew prayer blankets, iron purificators, and fill coffee pots. The ministry of chair folding brings the good news to many, indeed. 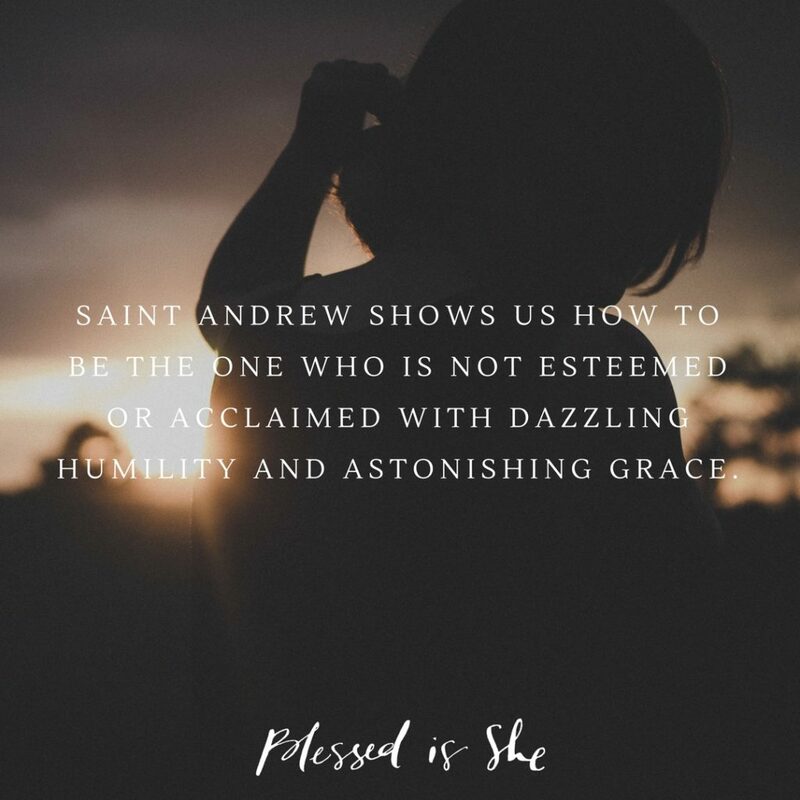 Thank a “Saint Andrew” figure in your life today—someone in your family, in your parish, in your workplace—for their humble heart of service in bringing people to know Jesus. Emily Wilson-Hussem planned her whole life to become a sports reporter but turned out to be a Catholic musician and speaker at the hand of God. She lives out of her suitcase and travels across the world speaking to people of all ages. The heart of her ministry is offering encouragement to women in search of their true identity, and she loves every second of it. She is the author of I Choose the Sky. You can find out more about her here.